﻿﻿﻿﻿﻿﻿﻿﻿South Llano River State Park offers water, woods and wildlife. ﻿﻿﻿﻿South Llano River State Park isn’t in Llano. It’s not just a pit stop along Interstate 10, either. South Llano River State Park is a destination with something to do for all ages, and its beauty has been appreciated for many years. In 1910, Walter White Buck Sr. bought the land that is now part of South Llano River State Park. A successful retired jeweler, Buck moved his family in hopes of finding a drier climate for his ailing son, Stroud. While Stroud passed away a year later, it was his other son, Walter Jr., who became devoted to the land as he and his father became ranchers. In fact, Walter Jr. never married and claimed that the land was his one great love. Perhaps he enjoyed the shaded pecan and buckeye bottomlands, the abundant wildlife or the clear waters of the South Llano River. ﻿The spring-fed river proves inviting for kayakers and swimmers. The South Llano River is spring-fed, so its constant flow makes it a fun year-round destination. 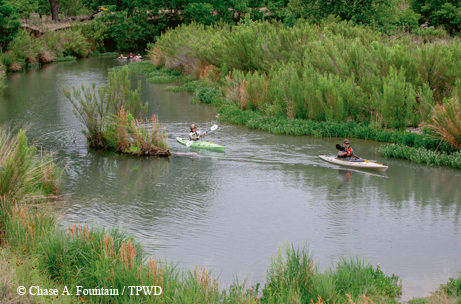 Beat the summer heat by renting one of the park’s inner tubes or bring your kayak or canoe to experience six miles along the official Texas paddling trail that runs through the state park. The river attracts abundant wildlife, so you don’t have to look far to catch a glimpse of a critter. Keep your eyes open for white-tailed deer, armadillos and jackrabbits. If you’re lucky, you may spot porcupines or ringtails. The river also supports quality fishing opportunities for several species of sunfish, catfish and bass, including the official state fish of Texas, Guadalupe bass. Some of the main features of the park, however, are for the birds. 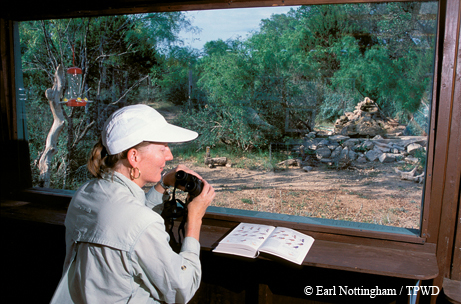 ﻿Bird-viewing blinds give visitors a chance to observe feathered friends. If you visit the park from Oct. 1 to March 31, you’ll notice that the pecan bottomland area is open only from 10 a.m. to 3 p.m. daily. For more than 100 years, many generations of turkeys have been roosting there, and because they are easily disturbed, the park protects this area. However, it’s open during the midday hours, and there are many other sites in the park to visit. Walter Buck Jr.’s love of the land led him to donate it to the Texas Parks and Wildlife Department in 1977. As you experience the park, see if you can spot the historical structures that tell the story of ranching and remember the legacy that Buck left for us to enjoy. South Llano River State Park offers interpretive programs, camping, hiking, biking, picnicking, wildlife watching, fishing, tubing, swimming, kayaking, stargazing and more. To reach the park, follow Interstate 10 to Junction, and then go south on U.S. Highway 377 for five miles to Park Road 73. For more information, go to www.tpwd.state.tx.us/southllanoriver or call (325) 446-3994.